Organizations today understand the value to be derived from arguably their greatest asset—data. When successfully aggregated and analyzed, data can unlock valuable insights, solve problems, improve products and services, and help companies gain a competitive edge. However, analytics executives face significant challenges in collecting, validating and analyzing data to deliver the right analytic insight to the right person at the right time. This e-book is designed to help. First, we'll explore the growing expectations for data analytics and the rise of the analytics executive. 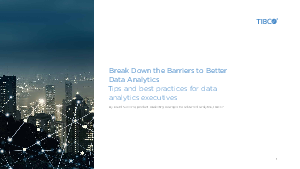 Then we'll explore a range of specific challenges those executives face, including those around data blending, analytics, and the organization itself, and offer best practices and strategies for meeting them.